Mulatu Astatke - Mulatu Steps Ahead. Vinyl LP. Bleep. 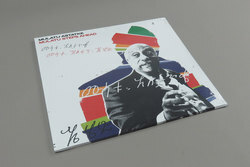 Given the huge surge in interest in Mulatu Astake’s work that we’ve seen over the course of the 2010s, now seems like a good time for Strut to be re-pressing his 2010 LP Mulatu Steps Ahead. This record almost acts as microcosm of Astatke’s huge and varied output. Among these nine tracks are classic Ethio-jazz numbers (‘The Way To Nice’), Afro-Latin-influenced jams (‘I Faram Gami I Faram’), vibraphone boogies (‘Boogaloo’), beautiful free experiments (‘Assosa’) and more. A class act.